Quality Hunting, Target, Sporting and collectible firearms. Payment Instructions: Payment is due within 5 days of auction sale date. CT Firearms Auction accepts payment by cash, check, wire transfer, and all forms of credit cards. The fastest method of payment is by credit card through our online payment portal. Invoices are sent by e-mail within two business days after the auction. Please note that first time and out-of-state checks require clearance prior to the release of merchandise. Additionally, high value and restricted items may require additional clearance time regardless of payment method. Some transactions may be subject to mandatory wire transfer payment. Shipping Instructions: Shipping fees are at the buyers expense and will be included in your invoice when applicable. Most Handguns ship for $30 each, Most Long guns ship for $40 each. Insurance is required and billed at 1% of invoice price. Special and large Shipping quotes must be obtained at least 48 hours prior to the auction. Pickup of all winning items is ONLY by appointment during normal business hours. You must call ahead or your item may not be available for pickup. Storage beyond 14 days of the auction is not available and all winning items must be removed, shipped or delivered within 14 days of auction date. Any lots that left longer than 14 days may be forfeit unless prior arrangements are made in writing. Checkout Date & Times: Pickup is by appointment only. 12Ga. 26" bbl, 2.75" chambers, Improved Cylinder and Modified chokes, engraved receiver, New Old Stock, in original box with papers. Estate Group of Knives to include a NIB KABAR USMC reproduction (rusty from storage), a NIB Reproduction v-44 Raider USMC Bowie (good), a cased repro US Marine Raider Stiletto (number 1180, excellent condition), and two as-is hunting knives by Ka-Bar and colonial. Estate Group of Knives to include a NIB KABAR USMC reproduction (rusty from storage), a NIB Reproduction v-44 Raider USMC Bowie (good), a cased repro US Marine Raider Sti...moreletto (number 1180, excellent condition), and two as-is hunting knives by Ka-Bar and colonial. 3 WW2 German Army badges. The first is a helmet with 2 swords crossing: this is a wound badge "black" reinstituted by Hitler in 1939, given to soldiers with 1-2 wounds in combat. With a Blockade runners badge awarded to crews of merchant vessels who successfully avoided the allied blockade. The last is a Pilots badge instituted by Goring on 26th of March 1936 and awarded on completion of training. These are original with heavy wear throughout. The pilots badge has a broken clasp, the others are functioning. 3 WW2 German Army badges. The first is a helmet with 2 swords crossing: this is a wound badge "black" reinstituted by Hitler in 1939, given to soldiers with 1-2 wounds in...more combat. With a Blockade runners badge awarded to crews of merchant vessels who successfully avoided the allied blockade. The last is a Pilots badge instituted by Goring on 26th of March 1936 and awarded on completion of training. These are original with heavy wear throughout. The pilots badge has a broken clasp, the others are functioning. The gun that won Smith & Wesson a lawsuit from Glock... very similar to Glock and their polymer frame guns. The Smith SW40VE is a durable and reliable pistol. This one is in excellent shape and comes with a total of 4 mags, Two 14rd mags and Two 10rd mags. The gun that won Smith & Wesson a lawsuit from Glock... very similar to Glock and their polymer frame guns. The Smith SW40VE is a durable and reliable pistol. This one is...more in excellent shape and comes with a total of 4 mags, Two 14rd mags and Two 10rd mags. Unbelievably smooth action, top quality product from Colts snake era. Ideal carry and shooter. Very good to excellent condition with only some bluing loss at the muzzle. Factory New Old Stock. Stripped virgin AR lowers. No Sale to ban states. 9x17mm Caliber Pistol with one magazine and leather Holster. Slide marked CZ26, Serial 35374. Frame marked J with lion Cartouche and number 26. Top of Slide marked: Ceska Zbrojovka as v Praze 35374. approximately 50% finish, good function. minor rust, marks on stocks. 9x17mm Caliber Pistol with one magazine and leather Holster. Slide marked CZ26, Serial 35374. Frame marked J with lion Cartouche and number 26. Top of Slide marked: Ceska...more Zbrojovka as v Praze 35374. approximately 50% finish, good function. minor rust, marks on stocks. Very clean semi auto version of the TEC-9. Fires but fails to feed / cycle. Probably a simple part. Ideal project gun. Includes one 30rd mazine PINNED to 10rd. Pre ban. OK for CT transfer. Very clean semi auto version of the TEC-9. Fires but fails to feed / cycle. Probably a simple part. 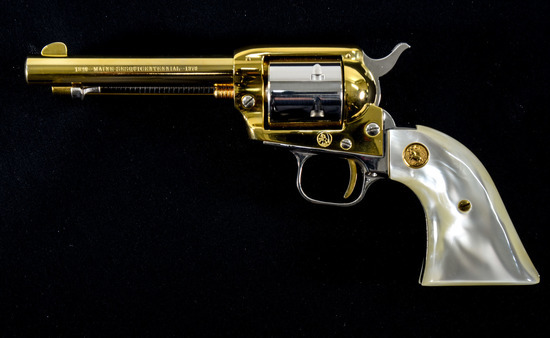 Ideal project gun. Includes one 30rd mazine PINNED to 10rd. Pre ban. O...moreK for CT transfer. 3 good quality lowers to start your AR build projects. Factory New in box. No Sale to ban states. 1911 style pistol with unique neon green zombie wrap and matching hogue grips. Looks new in box, not even a scuff mark on the feed ramp. You've been outbid to e****r! to YOU! United sporting Arms massive 10.5" barrel makes this a ideal gun for hunting and target. Heavy Solid stainless with an unfluted cylinder. Functions like new. Does not appear to have been fired much at all. United sporting Arms massive 10.5" barrel makes this a ideal gun for hunting and target. Heavy Solid stainless with an unfluted cylinder. Functions like new. Does not app...moreear to have been fired much at all. Circa 2004. this Vaquero has the older style, larger frame that some prefer. This example is unique with its birds head grip and Bright Stainless finish. Ideal shooter for cowboy enthusiast. Like New, pistol rag but no box. Circa 2004. this Vaquero has the older style, larger frame that some prefer. This example is unique with its birds head grip and Bright Stainless finish. Ideal shooter f...moreor cowboy enthusiast. Like New, pistol rag but no box. Smith & Wesson Compact and light weight Model 49 Bodyguard with enclosed hammer. This gun is in excellent condition. Blued Steel frame. only some minor pitting on backstrap. Function is good. Smith & Wesson Compact and light weight Model 49 Bodyguard with enclosed hammer. This gun is in excellent condition. Blued Steel frame. only some minor pitting on backstr...moreap. Function is good. You've been outbid to v****3! to YOU! Iconic 1970's pocket pistol / saturday night special. This chromed example functions fine. Worn with nicks and blems.